Click on the desired time and date in the calendar. A window will open. Give your event a title, description, location, and set the time and date as well as notification method (email or SMS). You can make the event private. If you share the calendar with other users, information about this event will be available only to participants of the event. To do this, click More settings and turn on the Hide event information from everyone except participants option. At the very top of the Yandex.Calendar page, click . A window will open. Give your event a title, description, location, and set the time and date as well as notification method (email or SMS). You can make the event private. 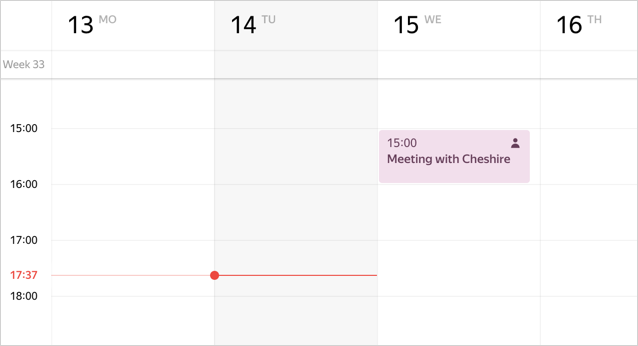 If you share the calendar with other users, information about this event will be available only to participants of the event. To do this, choose the option Hide event information from everyone except participants. 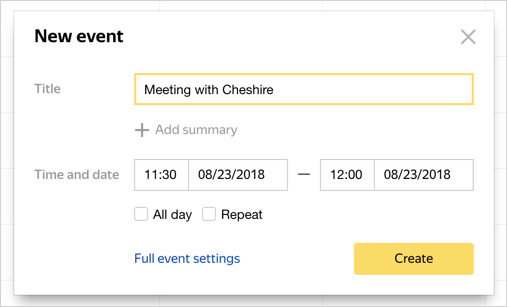 Click Create, after which the event will be immediately added to the calendar. The color of the calendar will change to indicate that an event has been created. If while creating an event an error message appears, it means that Yandex's security system believes your account is suspicious. To address this problem, please refer to the I can't create events section.